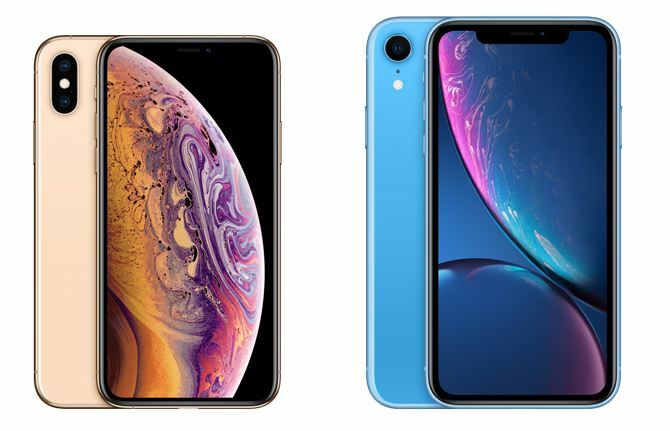 Apple unveiled three brand new iPhones last week: iPhone XS, iPhone XS Max, and iPhone XR. The iPhone XS and XS Max are identical in every aspect except battery size, screen size, and price. Apple is positioning the iPhone XR as an affordable model for people who can’t buy the more expensive iPhone XS or XS Max. So, how do the iPhone XR and XS differ? Let’s dive into a detailed iPhone XS vs iPhone XR comparison to see the differences between the two models, and why the iPhone XR could be a better buy. Both the iPhone XS and iPhone XR run the same A12 Bionic chipset and they are equally beautiful. But they have some notable differences. Both the models have a similar design with bezel-less displays and top cutouts and no physical home button. But that’s where the similarities end. The iPhone XS measures 143.6 x 70.9 x 7.7 mm and weigh 177g. By comparison, the iPhone XR measures 150.9 x 75.7 x 8.3 mm and weighs 194g. The XR is larger, thicker, wider, and heavier than the XS, largely due to its larger display and battery. The iPhone XS has a surgical-grade stainless steel chassis with glass front and back. The XR also has a glass front and back, but it uses the aerospace-grade 7000 series aluminum chassis similar to last year iPhone 8. Also, the XS comes with an IP68 rating for-water and dust-resistance, meaning it can survive in up to two meters deep water for up to 30 minutes. The iPhone XR with its IP67 rating can remain submerged in water for the same length of time, but only up to a depth of one meter. But this shouldn’t be a deal-breaker. This is where you’ll notice the biggest difference between the two handsets. The iPhone XS has a 5.8-inch AMOLED display with a 2436 x 1125 resolution and 458ppi pixel density. It has an 82.9% screen-to-body ratio. In contrast, the iPhoen XR has a larger but slightly inferior 6.1-inch IPS LCD screen with a 1792 x 828 resolution and 326ppi pixel density. It also has a lower 79% screen-to-body ratio due to slightly thicker bezels. The iPhone XR does make a compromise in this department, but its display is more than sufficient for almost all purposes. The pixel density is the same as the iPhone 8, which was not bad at all. It also gets the same True Tone technology as the iPhone XS. The XR also lacks the 3D Touch, but again it’s not a deal-breaker. The 6.1-inch model instead uses haptic feedback like a trackpad. All the three iPhones boast the TrueDepth camera system on the front that supports Face ID, Animoji, and Memoji features. But there is a major difference between the two devices’ cameras. The iPhone XS a 12MP wide-angle lens with an f/1.8 aperture and a 12MP telephoto lens with an f/2.4 aperture. In contrast, the iPhone XR has only a single 12MP wide-angle lens on the back. Both the handsets have a 7MP snapper on the front for selfies. The iPhone XR offers 5x optical zoom and three portrait lighting effects. The iPhone XS gets 2x optical zoom, 10x digital zoom, and five portrait lighting effects. Despite lacking the second rear camera, the iPhone XR uses AI algorithms to capture portrait images with blurred backgrounds, just like Google Pixel 2. And you can manually adjust the blur to your liking after taking a picture. Both the iPhone XR and XS support the Smart HDR image processing technology, which combines multiple pictures taken at different exposures into a single image to enhance the dynamic range. Both the XS and XR run the same A12 Bionic processor with M12 motion coprocessor. So, the performance of the two handsets should be similar. The iPhone XS gets 4GB RAM compared to 3GB inside the iPhone XR. The additional RAM on the XS should help in multitasking, but that in no way means the XR is a sluggish phone. The iPhone X had the A11 processor and 3GB RAM, and it’s still more powerful than every single Android phone on the planet. With the A12 chip and 3GB RAM, the XR should be faster than the iPhone X. In terms of storage, the iPhone XS comes in 64GB, 256GB, and 512GB models. There is no microSD card slot on any iPhones. The iPhone XR will be available in 64GB, 128GB, and 256GB models. For most users, 128GB storage should be sufficient. Apple doesn’t reveal the battery capacity of the iPhones, but it does give us a fair idea of how long an iPhone’s battery would last. It claims the iPhone XR would last 90 minutes longer than the iPhone 8 Plus, which had the longest battery life of 2017 iPhones. The iPhone XS will last 30 minutes longer than the iPhone X, and the XS Max is supposed to last 90 minutes longer than iPhone X. It means the iPhone XR should have the longest battery life of all three models. The iPhone XS is available in Space Gray, Silver, and a new Gold color. But the 6.1-inch iPhone XR will launch in six vibrant colors: White, Black, Yellow, Blue, Coral (pink), and a PRODUCT (RED) edition. If you want vibrant colors, you know which iPhone you are going to like more. The iPhone XS and XS Max are already available for pre-order, and will hit the store shelves on Friday, Sept.21st. The iPhone XR has been delayed due to production issues. Its pre-orders will go live on October 19th and sales will begin on Oct.26th. The iPhone XR will cost $749 for 64GB, $799 for 128GB, and $899 for 256GB models. In contrast, the iPhone XS starts at $999 for 64GB, $1,149 for 256GB, and $1,349 for the 512GB model. The most expensive variant of iPhone XR is much cheaper than the base model of iPhone XS. You can get the 128GB XR for $800, flat $200 less than the 64GB iPhone XS. The iPhone XR retains the best features of the iPhone XS at a much lower price. It has the same processor, a longer battery life, a damn good camera, and vibrant colors. If you are an Apple fanatic, you could go for the iPhone XS or XS Max. But for most people, the iPhone XR is more appealing.